Amazing, simple and fast salad. 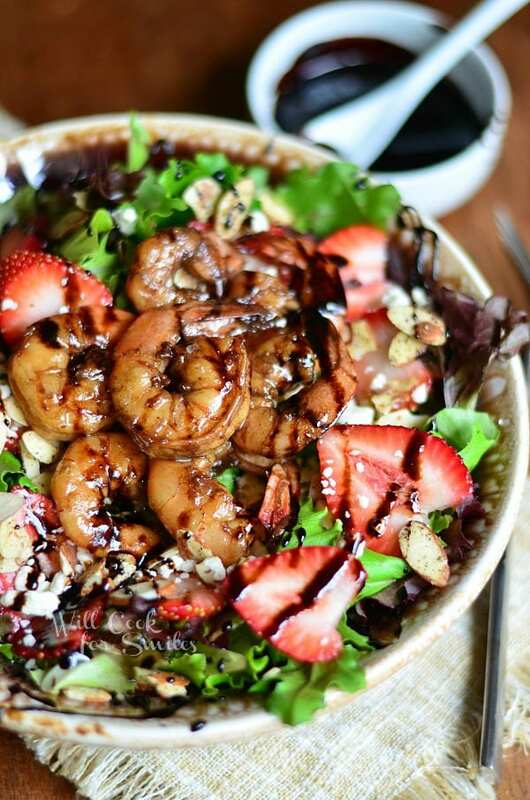 Buffalo sauteed jumbo shrimp on a bed of greens and veggies, topped with blue cheese crumbles. 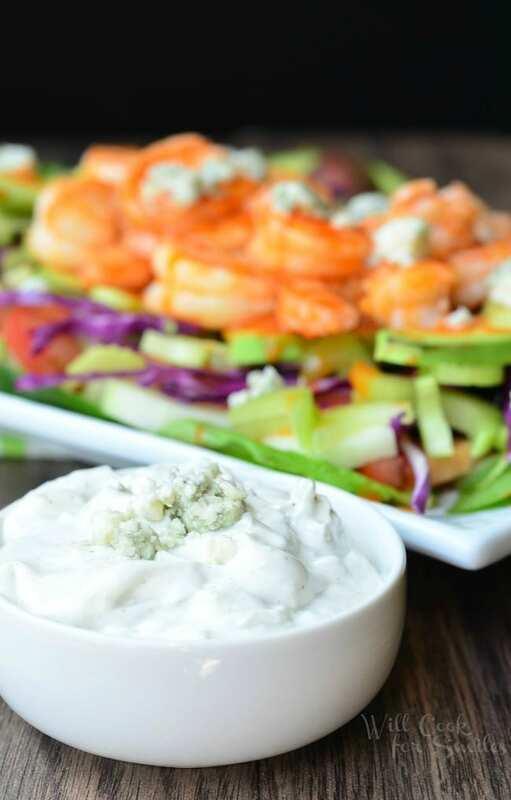 This delicious salad is served with homemade blue cheese dressing. I just realized how long it’s been since I’ve made a buffalo sauce recipe. I realized it when I suddenly started craving some buffalo shrimp. I don’t know what it is about the buffalo sauce and blue cheese (as well as ranch) combination that is always SO good, but I can’t get enough. Some of my favorite buffalo recipes have been Buffalo Chicken Nachos, Buffalo Chicken Burger, Buffalo Chicken Dip (aka crack dip). Oh goodness, looking at these old posts makes me want to have some nachos right now. It is so good! But this salad is just as good. It’s a nice, light salad for hot weather. 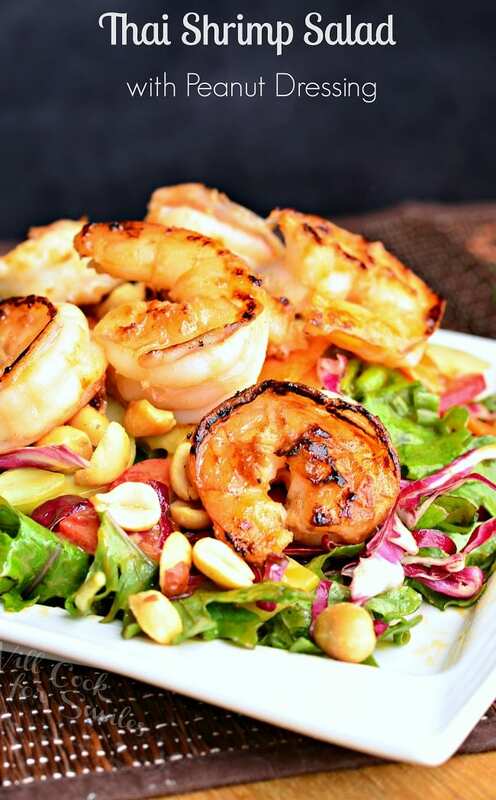 Shrimp is quickly sauteed with some buffalo sauce and tossed on top of cool greens and veggies. I love the vegetable combination here too. Crunchy cabbage, cool cucumbers and soft, ripe avocado. This salad has some heat to it, of course, since buffalo sauce tends to be spicy. All the veggies here are meant to cool down the spice from buffalo sauce. Avocado is especially great here because it’s very calming to the taste buds against the spice. 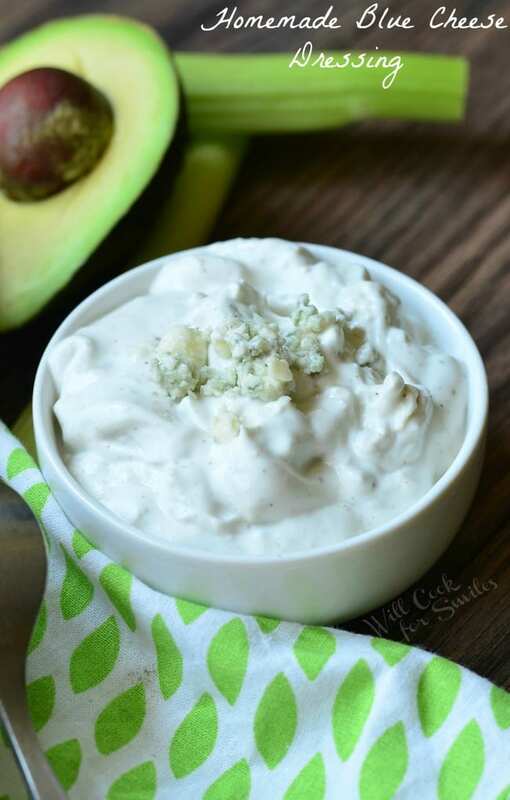 Creamy Blue Cheese dressing is the final perfect touch to this easy and fast meal. 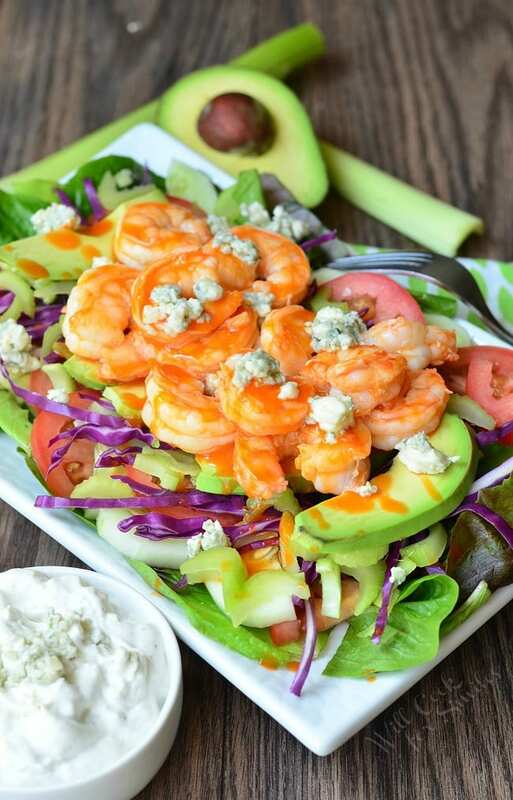 Buffalo sauteed jumbo shrimp on a bed of greens and veggies, topped with blue cheese crumbles. 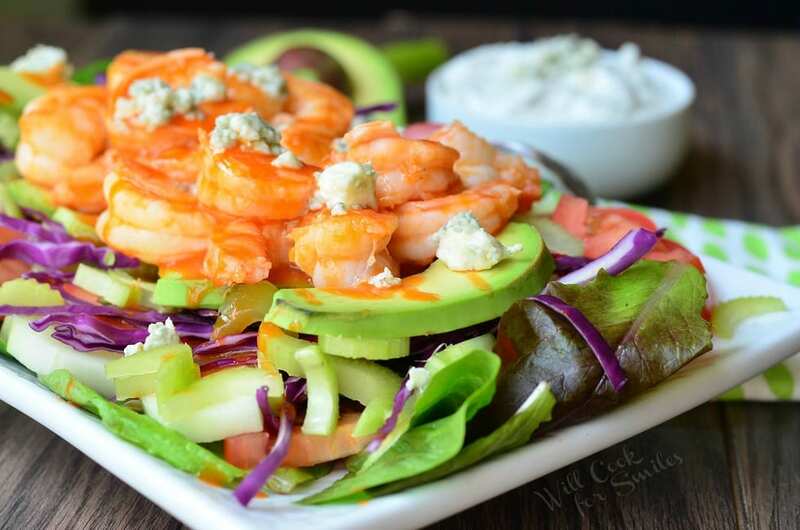 This delicious salad is served with homemade blue cheese dressing. Prepare your salads by layering lettuce mix with veggies on top. Preheat a cooking pan over medium heat. Add vegetable oil. Wash, peel and de-vain the shrimp while the pan is preheating. Add shrimp to the pan and salt to taste. Once shrimp start turning pink, flip them on the other side. Add buffalo sauce and cook until all shrimp turn pink. 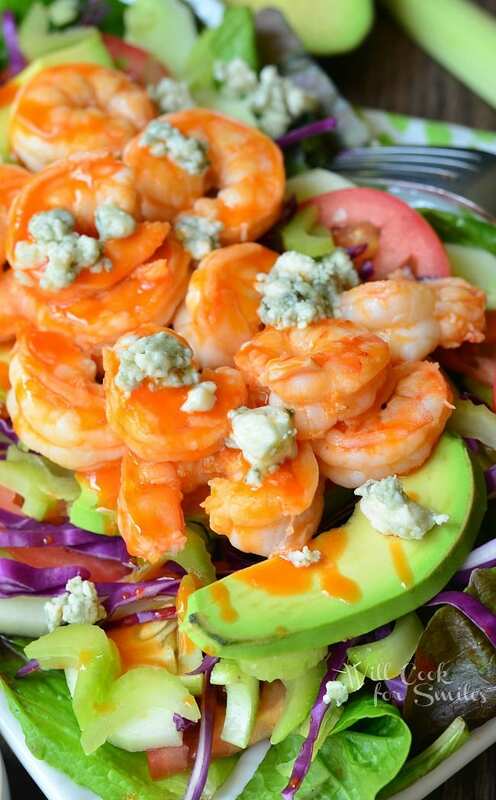 Divide shrimp among the two salads equally and make sure to pour the buffalo sauce on the salad with the shrimp. It will mix nicely with blue cheese dressing. Sprinkle blue cheese crumbles over the salads. In a small bowl, whisk sour cream and mayo together. Whisk in vinegar and milk. Add blue cheese crumbles and work them in with a fork, pressing and mixing slightly. 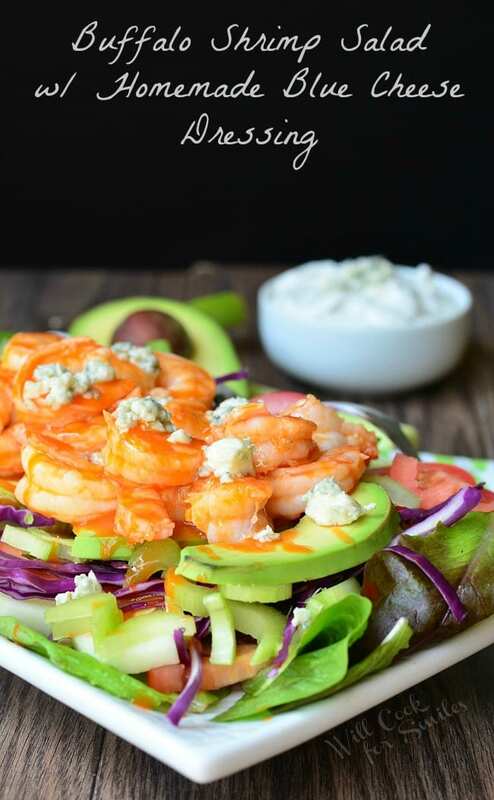 Your buffalo shrimp salad looks absolutely amazing…I am so addicted to buffalo anything. 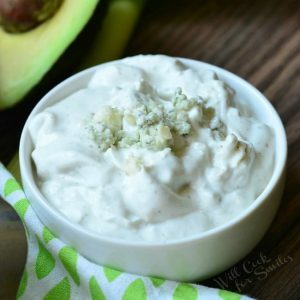 And homemade blue cheese dressing…yum! Pinning and sharing…definitely want to try this! Thanks so much for also sharing my kale and blueberry salad…that was so nice! 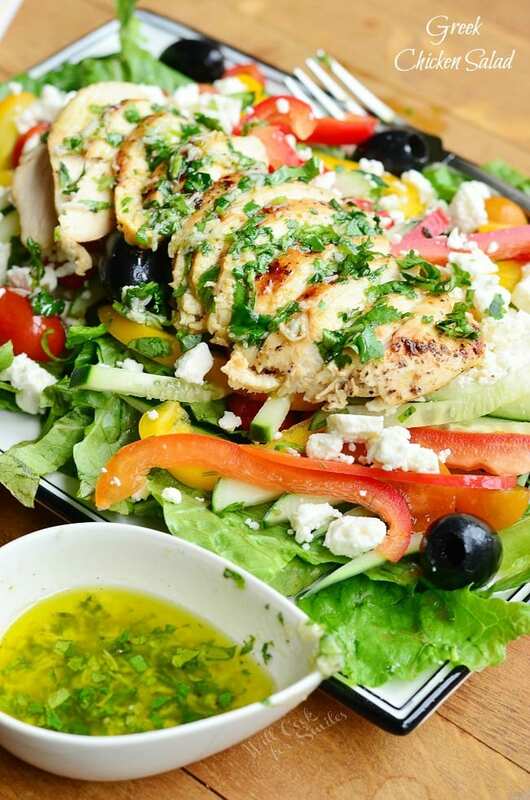 Very nice salads, I like all! 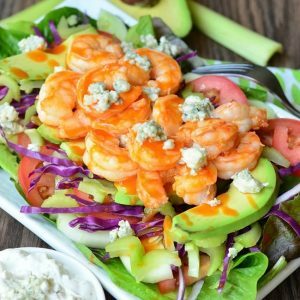 I would like the recipe for the buffalo sauce used in the salad. You have the blue cheese one but not the one to cook the shrimp in. Hi Janet! The buffalo sauce, can also called winger sauce, is actually store-bought. It would be in the condiments section.